The Original Perplexus. 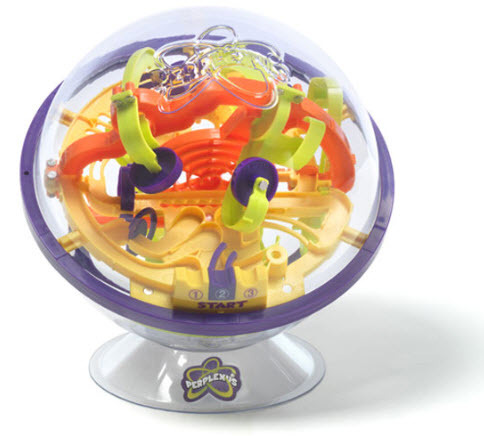 Perplexus is a maze game where players must maneuver a small marble around challenging barriers inside a transparent sphere. Unlike traditional flat-surface mazes that are composed of one path, Perplexus houses various exhilarating tracks with 100 barriers and provides a three dimensional experience. Players select which track they would like to attempt, and then must work with gravity and carefully shift, flip, and twist the sphere to guide the marble. Players can race each other or the clock. There are many fun ways to play PERPLEXUS. It works as both a single player game and as a multi-player competitive game. On top of being entertaining, Perplexus is also an educational toy, and assists in child development. It is a great toy for children to exercise their motor and dexterity skills, as well as improve their hand-eye coordination. Its small size makes it easily portable. No batteries required. Ages 6 and above.